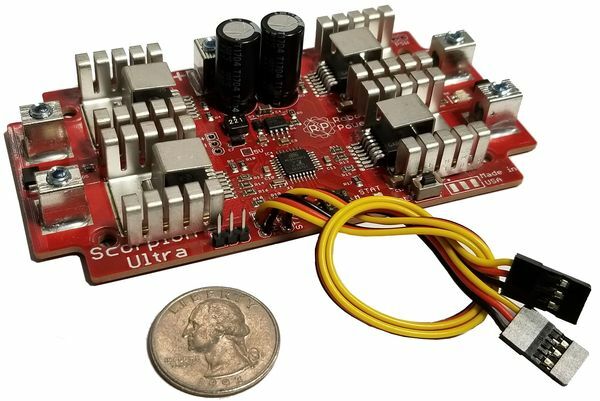 The Robot Power Scorpion Ultra is a flexible high-performance two-channel motor controller for medium to large mobile robots such as competition firefighting robots, sumo, robotic combat, theater props, inspection and other applications. It may be used on robots up to as much as 150 pounds or more as long as the motor current limits are respected. The Scorpion Ultra is suitable for other applications as well including lights, hydraulic valves and other static non-robot uses. 35A continuous current (70A peak) each on Left and Right channels. Size: 4.5" x 2.35" x .6"
Receiver battery eliminator circuit (BEC) standard - may be disabled. This can provide up to 200 mA of current at 5V to the RC receiver and other attached electronic circuits. The Scorpion Ultra software is designed to work with most R/C systems out of the box. The most common options are set up as the default so no complicated configuration, calibration, or programming is required. The controls shown in the image above, left to right, are: BEC jumper, RC wires for Steering/Throttle or Right/Left channels, Option DIP switches, Status LED and the Calibration button. BEC - the internal 5V regulator on the Scorpion Ultra is connected to the power wires on the servo leads by default. This allows the Scorpion to provide power to the R/C receiver or other external circuits and eliminates the need for an external R/C receiver battery. Cutting the BEC jumper on the PC board disables this function and allows a separate 5V supply to power the R/C signal source (receiver or microcontroller). Calibrate - a pushbutton switch is provided to activate the Scorpion Ultra calibrate mode. This mode is used to map the radio or other RC signal source to the full range of motor outputs. The range of values sent by the radio system or microcontroller is recorded and the Scorpion Ultra stores the values in non-volatile	memory and retains them permanently. It is also possible to reset the values to the factory defaults. A Documentation for the Scorpion Ultra with details on setup and operation of the controller will be available soon from the downloads page. Contact us for any detailed questions about setup or use of the Ultra. Robot Power offers the Scorpion Ultra in fully assembled units ready to install and use. Check the Web store for details on prices and special offers.